Hotel El Ganzo provides plenty of opportunities for rest, rejuvenation and pampering — but you’ll also be able to indulge as much as you like, with our well-crafted menus of gourmet cuisine and artisan cocktails. We also give you the chance to expand your mind, with a host of curated arts and music programs, where you’ll be able to see live performances and perhaps chat with artists about their work. And its location at the base of the Puerto Los Cabos marina means that you’ll never be far from an array enticing Los Cabos activities. The 72 guest rooms and suites at Hotel El Ganzo are simple yet sophisticated, and fully equipped for comfort — they’re the kind of place that you might create for yourself. Let’s start with the most important thing: Those super-comfy beds. They’re decked out with 400 thread count linens, comforters and pillowcases from Rivolta Carmignani, the Italian leader in luxurious fine linens. The VIP turndown service assures that you’ll have a comfy bed waiting for you at the end of each day. The bathrooms are just as attractive as the guest rooms. Each one is complete with shower and bathtub, double-basin marble vanities, full-size organic bath products (we hate those tiny bottles that most hotels force on you) and Guests terrycloth robes by Frette, a luxury Italian textile purveyor. 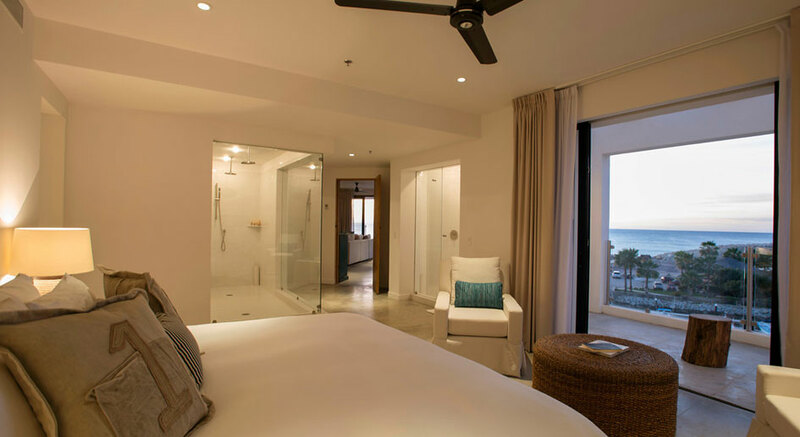 Rustic yet decidedly 21st Century, the Jacuzzi, Balcony and Ocean View rooms at El Ganzo combine simplicity and comfort. And with their great locations on three floors, each room has its own beautiful ocean view to enjoy. Measuring a generous 360 square feet/33 square meters, the suites are handsomely appointed with design elements like custom-created wood furnishings, crisp white linens and artistic wood headboards decorated with messages of love. Sliding glass doors lead to open-air terraces, assuring that each room has lots of natural light, not to mention a beautiful view. Within these thee categories, you can choose from a simply beautiful open-air terrace on the water, or perhaps indulge in a Jacuzzi Suite, which has an inviting outdoor Jacuzzi on the terrace — the perfect place to relax and forget about the complications of life. If space is what you crave, then El Ganzo’s Large and Very Large Suites are your best option. Guests checking into these suites will find they’ve escaped into a world of ample comforts, with features including a spacious living area, a grand salon, private terrace and indoor/outdoor Jacuzzi. The billiard table will help to keep you entertained, while the small private gym will allow you to stick to your fitness routine with no outside distractions. Stunning water views imbue a sense of peace and tranquility from nearly every angle of the one-bedroom Very Large Suite. So whether you’re in the mood for cocktails on your private terrace, lounging in your handsome living room or snuggling into the masterfully designed bed after a VIP turndown, you’ll enjoy Los Cabos like never before. You’ll find so much to do at Hotel El Ganzo – Design Boutique, Arts, Live Music, Marina & SPA – Los Cabos that you might be tempted to stay on the property during your entire visit. Every Wednesday, the El Ganzo Film Club screens classic and cutting-edge movies, live musical performances accompany dinner on Thursday and Friday nights, Saturday brings music and art to the forefront yet again with curated presentations by visiting artists and Sunday is the perfect time for a festive Mexican brunch, with live music and the best view in town. Sun lovers will find lots of diversions at El Ganzo’s Beach Club, where activities include volleyball matches, paddle boarding, kayaking, canoeing and snorkeling (not to mention the perfectly logical option of just lying in the sun). As wonderful as the El Ganzo experience may be, you shouldn’t miss out on the additional fun that awaits nearby. Our savvy staff can recommend the most interesting and even offbeat activities — whether it’s exploring cool nightlife, joining the Thursday night Art Walk in San José del Cabo, or bicycling past impressive yachts, original sculptures and a dramatic cactus garden. Consider us your personal entertainment gurus and ask away. They will find the right activity for you. Nothing says “ooh” quite like an infinity pool, and the graceful stretch of water that occupies some 2,013 square feet/187 square meters on our roof is especially alluring. Bali daybeds dot the perimeter, inviting guests to relax and perhaps enjoy a cocktail as they gaze at the beautiful Sea of Cortez. An eclectic music mix — which often includes original work produced at the Underground Studio — helps to set the tone here. After dark, the pool is dramatically illuminated and the nearby fire pit may be lit, providing a memorable ambiance for nighttime socializing. El Ganzo is the only hotel in Los Cabos that has its own underground recording studio, a 1,700- square-foot facility where artists from around the world are welcome to hone their craft. Located dramatically beneath a trap door in the Downstairs Restaurant, this state-of-the-art audio facility was designed by Hotel El Ganzo’s studio manager/artist-in-residence Mark Rudin. Other artists in residence — who usually stay for periods of four to five days — also produce work here, and play live shows at the hotel’s three venues. Hotel El Ganzo aims to delight your senses, and taste is a decidedly important one. Whether you’re in the main restaurant, on the roof or at the beach, you’ll find lots of delicious choices. With sustainable, farm-to-table cuisine and its own weekly farmer’s market, El Ganzo excels at satisfying. El Ganzo’s Downstairs is the hotel’s culinary heart. Handsomely decorated with handcrafted wood tables and two fireplaces set within a gorgeous stone wall, the Downstairs restaurant begins each day with tasty breakfasts, including freshly squeezed juices and the must-try traditional Mexican favorite, chilaquiles (irresistible creations made with tortillas served with eggs, onions and fresh panela cheese). Lunch can include delicacies like shrimp ceviche, fresh seafood tacos and quesadillas and gourmet pizzas. After dark, the Downstairs restaurant becomes a stylishly illuminated venue, where guests dine on mouthwatering gourmet entrees like lion paw scallops with cauliflower puree and Tlacoyo de pollo (chicken with corn milk, refried beans, cactus slices, Mexican Cotija cheese and pasilla chili sauce — believe us, it’s amazing). A small performance space adjacent to the dining area serves as the stage for visiting musicians to perform on Thursday and Friday nights. Oh, and the desserts. They’re especially tempting, with chocolate fondue, crème brulee and traditional Mexican churros among the treats that await. If you’re craving something even more international, check out the far-flung destinations in the spotlight at the Gachoo Sushi Bar, which specializes in Japanese and Peruvian cuisine, with ceviches, carpaccios, tempura and sashimis among the offerings. The hotel also maintains a well-stocked wine cellar, which means you can enjoy lunch or dinner with varietals from Mexico, Argentina, Australia, Chile, Italy, New Zealand and the United States. And if you’re spending the day on the sand, not to worry. Ganzo de Playa, the hotel’s beach club, serves its own unique menu, including salads, Baja-style fish tacos and even hamburgers and hot dogs. Chilling out is a good thing. And at Hotel El Ganzo, it’s easy to do. Just pick your ideal treatment from the extensive spa menu and make a reservation. The spa at El Ganzo has five spacious treatment rooms, as well as a therapy pool, sauna, steam room and indoor gym with Kinesis. Choose from indulgences like the Damiana Flower Treatment, which uses the unique aphrodisiac properties of a Baja desert flower to exfoliate and hydrate, or the Mezcal Ritual, a detoxifying experience that fosters relaxation and self-awareness, with an agave scrube, mezcal lotion massage, and desert clay purification process. A tranquil relaxation room allows for blissful transitions between the “real world” and our services, while separate manicure/pedicure area provides a soothing respite, and a small retail area allows guests to bring their favorite products home. Whether it’s a relaxing massage, a rejuvenating skin treatment or refreshing aromatherapy, guests benefit from an array of eco-friendly, organic products. And the expert therapists are trained to know what makes people tick, so they’ll make sure you leave feeling better than ever. El Ganzo knows how to stage weddings and gatherings with style. The property has 360 square feet/33 square meters of function space, beautiful picture windows that provide lots of natural light — as well as picturesque ocean views. It’s an inspiring and beautiful place to say I Do. Groups can also order custom menu creations from El Ganzo’s gourmet kitchen and make use of some public spaces and restaurant areas for their own private events.